Ongoing challenges in Deutsche Post-DHL Group’s (DP-DHL) Post-eCommerce-Parcel (PeP) segment depressed an otherwise positive third quarter for the Group. While DP-DHL posted operating profit (EBIT) gains in Express, Global Forwarding and Freight, and Supply Chain segments, a substantial year-over-year decrease in third quarter EBIT for the PeP division weighed heavily on the Group’s overall EBIT for the quarter, which declined by 54.9% y-o-y to €376 million. The Group’s revenue increased 1.4% y-o-y to €14.85 billion, and net profit declined 77.2% y-o-y to €146 million. DP-DHL’s results from the first and second quarters of the year also suffered from challenges in the PeP division due to higher costs and capital expenditures. However, the Group has maintained the turnaround in EBIT for the Supply Chain division from last quarter, with the division posting a 3.4% y-o-y increase to €148 million during the third quarter. The Group’s CEO, Frank Appel, said that the implementation of “measures to improve productivity and cost structure” to the Group’s PeP segment, initiated last quarter, will yield positive results. He also said these results will become “clearly visible over the next year” despite the significant rise in macroeconomic risk factors in recent months related to trade disputes and currency fluctuations. The Group also reiterated that the decline of PeP was above all due to increased expenses to the program, which contributed to the significant decline in EBIT for the division. Post-eCommerce-Parcel: Revenues for PeP increased 0.6% y-y to €4.33 billion, while EBIT fell to a loss of €209 million. The Post business unit’s revenue declined 2.3% y-o-y due to ongoing volume declines in mail. As noted above, higher transport and staff costs contributed to the substantial decline in EBIT for the quarter. DP-DHL plans to address the costs with a series of initiatives, one of which includes an early retirement program, in addition to larger restructuring in the division, as reported by our sister publication, Air Cargo World. DHL Express: The Express division posted a revenue increase of 7.2% for the quarter to €3.91 billion. EBIT rose by 9.9% to €409 million, driven by continuous growth in the Time Definite International delivery business, which increased daily volumes by 5.3% y-o-y. The division also invested in its network infrastructure, particularly in Leipzig, Cincinnati, Hong Kong, and Madrid. Capital spending focused on maintenance and renewal of their aircraft fleet, including further advanced payments for the renewal of the Express intercontinental and aircraft fleet. DHL Global Forwarding, Freight: Revenues in Global Forwarding and Freight were up 4.2% for the quarter to €3.68 billion, and EBIT rose by an impressive 58.2% to €106 million. 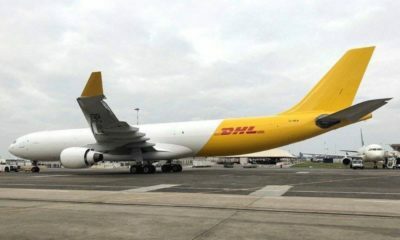 DHL attributed the division’s success to rising freight rates, despite negative currency effects. DHL Supply Chain: Supply Chain revenue fell 6.4% during the third quarter to €3.27 billion, but EBIT increased 3.4% to €153 million. In line with last quarter, the Group attributed the lower revenue to negative currency and portfolio affects, resulting mostly from the sale of DP-DHL’s UK subsidiary Williams Lea Tag during 4Q 2017. After adjusting for those effects, the division reported a 3.0% increase in revenue. The Supply Chain division also cited volumes growing in the EMEA and Americas regions primarily in the Automotive and Retail sectors. In the Asia Pacific region, the Group said growth was generated in nearly all sectors.